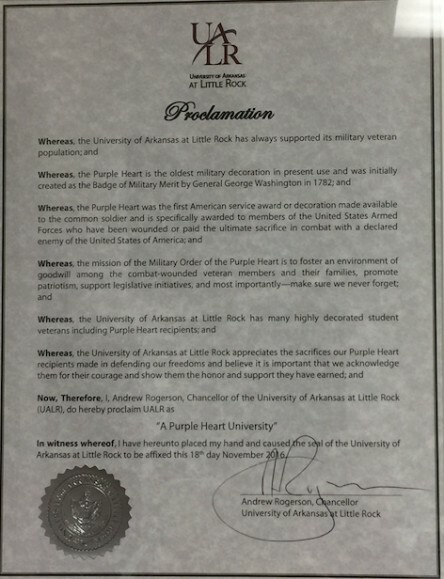 On November 18, 2016, the University of Arkansas at Little Rock was honored as a Purple Heart University during Hometown Hero Night. The designation signifies the university’s recognition and honor of veterans who were wounded in combat while serving their country and are now pursuing higher education and careers at UA Little Rock. The Military Order of the Purple Heart is a national nonprofit organization whose membership consists of veterans who have been awarded the Purple Heart medal for wounds received in combat. In 1992, the organization instituted a National Purple Heart Trail Program to create a symbolic and honorary systems of roads, highways, bridges, cities, counties, monuments, military installations, universities, and other institutions that give tribute to Purple Heart recipients. 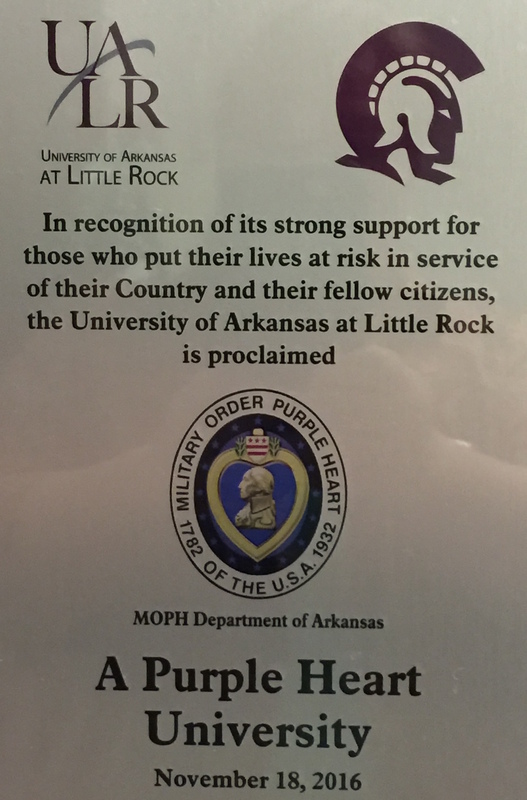 The Department of Arkansas and Central Arkansas Chapter 431 of the National Order of the Purple Heart presented UALR with a plaque and Chancellor Andrew Rogerson read the proclamation. 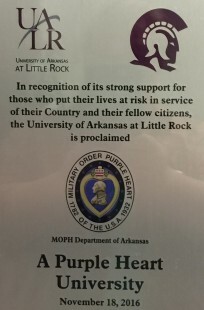 Both the plaque and proclamation hang proudly in the UA Little Rock Military Student Success Center.